The mountainous terrain of the Sierra Tramuntana and the unique produce of Spain’s Balearic Islands make Mallorca an exciting destination for active food lovers. It was not long ago that I was based in Mallorca for my work as a private chef in the yachting industry and often I would fill my winter weekends and days off with treks exploring the mountains and villages and of course the restaurants and cafes. Fond memories of Mallorcan cuisine start with the mild aroma of olive wood and wild rosemary and the bleating of mountain goats. Just north of the small town of Alaro in the centre of Mallorca, if one follows the signs through the winding olive groves towards El Castell, the entrance of a Moorish ruined fortress and cliff- top chapel can be found. Perched on the roof of El Castell d’Alaro with a $4 glass of Crianza, a breathtaking view of the Sierra Tramuntana and the town of Alaro below can be enjoyed. On descent, a hard-earned lunch break at Es Verger restaurant is highly recommended (Es Verger, Castel d’Alaro, Alaro, Mallorca). With long tables nestled next to wood burning ovens in an old family barn, hikers and locals munch on bread and olives. The shoulder of lamb here is pure comfort food. As are the caricoles, snails in garlic butter broth, picked out carefully with a toothpick. And to finish it all off, the famous electric coffee, a long black coffee with rum, set fire to at the table. My bill was always under $40. Venturing further across the vast landscape of the Sierra Tramuntana is the village of Llosetta. Starting early in Placa de Lloseta hikers take the road followed by pilgrims centuries ago through olive and almond groves to the small hamlet of Biniamar and the traditionally farmed land of ancient Mancor de la Vall. Home of the Fira de Esclatasangs, a festival held every November, Mallorca’s own breed of reddish-brown wild mushrooms, called the esclatasang, can be found here in the autumn. I stop for a quick snack of Pa amb oli at Bar Can Bernat. The bread is warm, topped with crushed ramellet tomato and completed with a grilled esclatasang mushroom. Those who are familiar with Palma de Mallorca's Latin Quarter will in turn be well-acquainted with the lively area of Santa Catalina and its market. 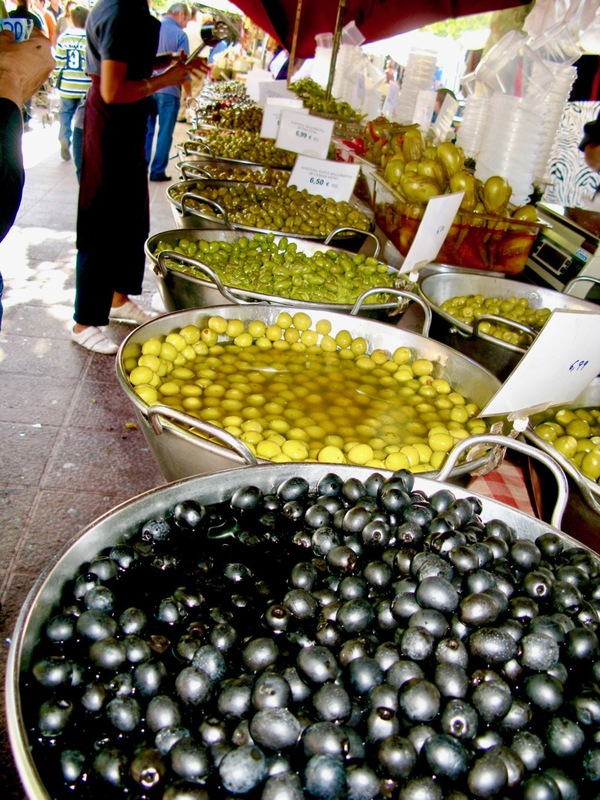 Here locals and visitors embrace a vibrant array of produce. In the south-west corner of the market a bubbly lady sells fresh boquerones, baby anchovies marinated in parsley, garlic, vinegar and olive oil. The fish stalls display scarlet Mallorcan prawns. From a small speciality shop one can try a cut of well-known Balearic pork sausage made with minced pork meat and spices such as paprika called Sobrassada. Pick up a packet of Mallorca’s much-loved salty biscuits called galletas d’inca, and slather it with the Sobrassada. And, of course, no market trip would be complete without cheese. Some wedges of aged Mallorcan cheese (a crumbly cow/goat’s milk cheese) and a semi-cured Menorcan variety, Mahon, go perfectly with native Mallorcan vine strung ramellet tomatoes. And don't forget the amazing juicy white peaches! Having visited Mallorca on a number of occasions, a tour around Palma’s Old Town is a definite recommendation for any avid walker. The architecture alone reflects the islands constant changes in occupation, from La Seu, Mallorca’s stunning gothic cathedral, to the Arab baths located east of the city walls. These baths reveal one of the last surviving sites of Moorish architecture in Mallorca and offer a cool respite from its bustling streets (Banys Arab, Carrer Serra 7, Palma de Mallorca). Whilst meandering through the medieval quarters one can become distracted by boutiques with their wonderfully crafted leather goods and myriad of street performers. The work of Gaudi, as seen at the Gran Hotel and surrounding buildings in Plaza de Mercado adds another dimension to the architecture of the old town. On a food trek, however, it is vital to take some time to visit Lo Di Vino (Carrer del Carmen 16, Palma old town). The owner, Pedro, will charismatically take you on a wine tour of Spanish and Mallorcan wines, as you munch on Iberico ham and local cheese. And don't forget to stop by the Panaderia de la Mision (C/Mision 36, Palma) to pick up a sweet caricola ensaimada for the following days breakfast. Made using a centuries old recipe including flour, eggs and pork lard, traditional unfilled ensaimadas are topped with icing sugar and are a staple of the Mallorquin diet. Dinner rarely starts before 9pm at the earliest in Spain - a far cry from dinner time in Perth, with most restaurants cleaned up and closed by 10.30pm. Marc Fosh’s acclaimed restaurants, such as Simply Fosh (Hotel de la Misio, C/Missio 7A, Palma, +34 971 720 114) have withstood the test of time and the 2008 financial crisis that hit Spain. His paired down but elegant restaurant offers an affordable three-course lunch for $35, with main meals including cuttlefish with smoked rice. Fosh still manages to incorporate Mallorcan ingredients seamlessly and with simplicity. My personal all-time favourite in Palma de Mallorca was El Chaflan de Patxi (Carrer Espartero 28, Plaza del Puente, +34971284486) otherwise known simply as Patxi. I cannot help but return to this Basque-inspired restaurant whenever we visit. Rarely frequented by tourists, Patxi has a fantastic choice of Basque-style pintxos – tender foie gras, brazuela de pato and fried brie with cranberry, all cooked to order. Lamb chops and steak can be ordered by the kilo here when seated in the restaurant. Topped off with a choice of wines from across Spain, Patxi is one place I should perhaps keep an affordable secret. Experience with the food cultures and ingredients of Spain and the Balearic Islands influence many of the techniques and preparations used in the RiverMint kitchen. The honest rusticity of Mallorcan cuisine and its focus on fresh and light seafood dishes and spiced meat alternatives guides our approach to the wonderful native ingredients we find on our doorstep here in WA and beyond. Moving forward, we hope to continue to embrace our own Australian food culture and ingredients with integrity just as the ancient ethic groups of Spain, from the Catalans to the Mallorcans to the Andalucians, have for centuries. I land at midday at San Diego airport, welcomed by sunshine and a light breeze. Here I am in the second most desirable city to live in the United States. My husband greets me with a small Punto hire car, covered in dust, to take me on a weekend adventure. We could, of course, stay in San Diego. Why not? It is a culturally diverse city, relaxed and creative. Here you can visit one of its many splendid beaches, like La Jolla or Mission Bay, or hop on and off the city’s tram service delving into diverse art galleries and stopping at places like award-winning Café Chloe for a light lunch and a glass of crisp white. But, whilst there are so many activities and sights to see in San Diego I am in the mood for something off the beaten track. I need an adventure. And so, we leave the easygoing city of San Diego in search of fish tacos and unknown wines. To San Isidro border we head and continue south to the small cruise ship town of Ensenada in Baja California, Mexico. Ensenada is a far cry from the sun loungers of Cancun. As you pass Tijuana and Rosarita you realize how much of an impact the recent war on drug cartels has made. Ensenada, however, is a welcome escape from the daily pressures of life and many people take a weekend break from San Diego to enjoy what is considered to be Mexico’s northernmost culinary mecca. With both the Guadelupe and Calafia Valleys only a short and scenic drive away from Ensenada, Baja’s famed Ruta del Vino is a fantastic destination to visit with numerous wineries. Vinedoes L.A Cetto is considered a meeting place for local Ensenadenas and produces approximately 80% of wine that is exported from Baja. There are tours hourly of the wine-making facilities, including tours in English and a fantastic tasting experience with a charismatic and knowledgeable man whose family have been producing wine in the region for over 100 years. Vinos de Dona Lupe, on the other hand, is a smaller producer and the only organic wine producer in Mexico. There is more to the experience of Dona Lupe than the wine. Here we were greeted by dancers and musicians who also sold their handmade jewellery and leather goods at small stalls. We enjoyed a lovely lunch here and visited the small shop attached which sells locally sourced organic snacks, dips and sweets. Sat beneath the fruitful vines overlooking the vineyard, we watched as families sipped on tastings and sangria and enjoyed the shade. Most importantly, however, were the many food stalls in central Ensenada. We were taken by friends Claudia and Jeremy to Mariachi Meno Meno, a renowned fish taco shack, close to the shipyard where they were dry docked. Here I am greeted with a small cup of spicy fish soup made with fish fresh from the local market across the street. The exotic clams and oyster gratin are two items not to be missed. And, of course, no Baja experience is complete without trying a fish taco– a battered fillet of fish, rolled in a warm soft tortilla. Before me on the table are a selection of condiments to add to my Baja fish taco experience. These included lime, cabbage, tomato salsa, red chilli hot sauce and a green habanero and tomatillo sauce that provides fresh zing and heat in equal quantities. My desire to experience a real fish taco was ticked off the list. Next on the list is the Sabina Bandera Ensenada eatery La Guerrense. Included in Newsweek’s 101 Best Places to eat on Earth, one has to stop here and try one of her myriad of salsas and the selection of 15 ceviches, including the sea urchin ceviche tostada. After wondering the main street of Ensenada, which really just contains numerous trinket shops for visiting cruise ship holiday makers, I returned to our villa on the beach in Baja Cove, about 40 minutes drive from Ensenada. Along the way we came across a man, his dog and a donkey with spray-painted stripes ..... now known as a Zonkey....... the things people do. Close to La Bufadora, a local blowhole that draws in large crowds over the weekend, I relaxed overlooking the ocean, munching on cactus freshly barbecued.. It was very tasty...... thanks Mexico. “Lest We Forget……” A squeaky, out of tune bugle demands respectful silence as it struggles to lament the Last Post. Anzac Day in the middle of the Indian Ocean. How did I end up here? The Australian flag flaps quietly as waves crash on the beach below. Anzac biscuits are distributed, sausages start to sizzle and the fizz of beer bottles opening all mix with the hum of anticipation………. Let the Two-Up games begin. I shuffle in close to join the circle of cray fishing families and privileged visitors, all waving 50 and 100 dollar notes. “Fifty heads” one woman cries…… “One hundred tails” yells a well-lubricated fisherman. And so it continues for three hours. A man everyone calls ‘Doc’ steps into the circle, he looks vaguely familiar with his sandals and rather prominent ears ……. ‘Head ‘em up Doc! Head ‘em up!’ a true-blue Aussie fisherwoman squawks. He hastily flips the coin in the air; it lands on tales. There is a groan from the crowd. Money changes hands, beer flows. I take a closer look and realise that ‘Doc’ is in fact British actor Martin Clunes – Doc Martin. Well, I wonder, how did he end up here? I later find out that Martin Clunes was visiting the Abrolhos Islands whilst filming his series "Islands of Australia". I had no idea when I accepted a freelance cooking position on a yacht, that I would end up anchored overlooking some of the most beautiful and remote islands in the world. The Abrohlos Islands are 122 islands located 60km north west of Geraldton on Western Australia’s Coral Coast.These islands are divided into three groups: the Wallabies Group, the Easter Group, and the Pelsaert Group, surrounded by 90 kilometres of Indian Ocean abundant with marine life. The reefs here have claimed many vessels, including in 1629 the Batavia. The seas are treacherous, the sharks curious, and the crayfish abundant. As the skies begin to darken and the wind rises, the visiting boating community clamber back into their dinghies and allow the small seasonal population that resides in the island’s fishing shacks to return to their quiet existence. It has indeed been a local experience like no other. The next day I prepare the popular and highly-prized west coast crayfish, or rock lobster as some might refer to it for lunch on deck. Straight from the pot, poo trail removed and into boiling water. I whisper 'I'm so sorry little guy", to each not-so little crustacean that I lower into the water. 10 minutes later, out they come, sliced straight down the middle, then drizzled with melted garlic and native basil butter topped with crispy WA Samphire and lemon. The flesh is sweet, succulent and meaty. I gaze out at the azure water and beyond on the horizon the almost blinding white sand of Turtle Bay. I reflect on this morning's swim break, below me exotic purple and blue corals inhabited by Dhufish and Coral Trout, above me circling white-bellied sea eagles. I think about the local cray fishermen who allowed us for half a day to become part of their closed circle. On Anzac Day, I ended up in one of the most beautiful places on earth. It was dusty, hot and the sights and smells so intense they were almost intoxicating…….. We had arrived in Varanasi. Being the first trip to India's Holy city, everyone had warned that being there during the Holy Week would be intense. After dropping our bags off at the hotel we gazed across the many ghats that lined the holy Ganga – a multitude of different coloured saris, walking, talking quickly, some men whacking clothing against concrete stones and washing, people doing daily prayers knee deep in water. A culture and landscape so far removed from Australia. We make our way out into the streets, dodging holy cows and their fresh dung which we later saw being shaped into patties and put in the sun to dry for fire material. Past the cute holes in the walls where fresh buffalo Chai was being served in small recyclable clay cups. Past the little tourist restaurants advertising ‘pizza’ made with chaat flour and Himalayan goat’s cheese. We emerged at a dusty square where fruit and vegetable stalls displayed papaya and mango and eggplants and spices. Children on their way to school. There was even the mandatory snake charmer! And then...... a man peddled past ringing his bell, a small icebox on the back of his bicycle – “Kulfi……Kulfi”….. Hot and craving something cold, we cautiously approach and with one lick discover a sweet cardamom and cinnamon- laced ice dessert never to be forgotten. So refreshing and different. Some might call it ‘curry ice-cream’ – you either love it or hate it. The following recipe has always been experimented with and changed to suit the occasion or desired flavour. The use of native spices like cinnamon myrtle, lilly pilly and pepper berry can be substituted for the traditional Indian spices of cardamom and cinnamon. Travel and discovery of other food cultures is an important part of every chef or cook's learning. With each trip, and the specialities discovered, we are able to return refreshed and inspired, ready to recreate and to fuse together international flavours to create ongoing reminders of the places we have been. 2 Lower to a simmer, add coconut cream and reduce by half. 3 Add sugars and desiccated coconut and simmer for ten minutes. 7 Alternatively, churn mixture in an icecream machine until at a soft serve consistency then pour into moulds. Garnish with nuts, gold leaf and shaved fresh young coconut or whatever you fancy.